Founding Directors - Friends of the Wild Flower Garden Inc. The Friends of the Wild Flower Garden was founded on June 18, 1952. 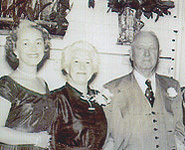 There were six founding directors - Clinton Odell, Russell H. Bennett, Mrs. Carroll Binder, Martha Crone, Donald C. Dayton, and Leonard F. Ramberg. Clinton M. Odell, as most readers familiar with the Friends will know, was the instigator of the whole affair. He was a botany student of Eloise Butler, visitor and sometime helper to her in the Garden. His business, the Burma-Vita Company was located just blocks away on Chestnut Avenue. He was also on the State Board of Forestry and a director of the McPhail School of Music. He provided financial assistance to the Garden while Martha Crone was curator prior to founding The Friends. He was President and a director of The Friends until his death in 1958. The others were all acquaintances of Mr. Odell. More details about Mr. Odell and the Friends HERE. 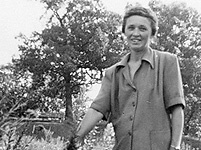 Martha Crone in the Garden, 1951. Martha Crone was the curator of the Eloise Butler Wildflower Garden at that time, having succeeded Eloise Butler upon her death in 1933. She become Secretary of The Friends with membership and newsletter duties, adding treasurer duties in 1954. She served in those roles until May 1971, remaining a director until 1973. She retired as Garden Curator in 1959. The Martha E. Crone Visitors Shelter in the Garden is named in her honor. More details about Mrs. Crone HERE. 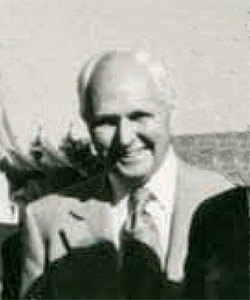 Russell H. Bennett, 1978 photo. 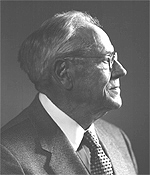 Russell Hoadley Bennett II was born on November 30, 1896. His father was a mining engineer and Mr. Bennett began the same career in 1922 as mine surveyor with the Meriden Iron Company. He held a number of positions in the mining industry including the positions of Chairman of Electro Manganese Corp in Knoxville, TN and of Placer Development Ltd. of Vancouver, BC. He wrote a book well known in mining circles in 1979 - Quest for Ore.
For his entrepreneurial and engineering accomplishments in the finding and development of challenging mineral enterprises throughout the world and his dedication to his fellow man, he was awarded in 1978 the AIME William Lawrence Saunders Gold Medal by the American Institute of Mining, Metallurgical, and Petroleum Engineers. In the Minneapolis area he was at one time the Mayor of Deephaven, MN, President of Dunwoody Institute from 1937 - 1948 and was Chairman of the Board of Dunwoody 1953 - 1957. In 1932 he realized a long-cherished dream and bought a ranch in southern Alberta Canada. From his experiences of becoming a rancher he wrote the book The Complete Rancher in 1965. Mr. Bennett was a founding director of the Friends of the Wild Flower Garden in 1952 and remained a director of The Friends until 1968 and was an honorary director until 1980. He and other long-time directors were invited to attend the 1977 25th Annual Meeting of the Friends and say a few words but he was unable to attend as he was on his way to his ranch in Alberta. He then attended the Annual Meeting the following year on May 20, 1978 at which he made a few comments indicating his pleasure at the progress being made in the Eloise Butler Wildflower Garden. This was his last meeting with the Friends. He passed away on Dec. 16, 1981 and is buried at Lakewood Cemetery. 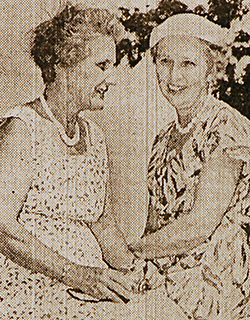 Dorothy Walton Binder (left) with just retired Garden Curator Martha Crone, at the dedication of a memorial in the Wildflower Garden to Clinton Odell. 1959 newspaper photo. Dorothy Walton married Carroll Binder on May 24, 1920, the couple having met while they were serving in the Red Cross, working with Belgian refugees during WWI. They both pursued journalism as a career, and after a few short stints at different newspapers, including the Minneapolis Daily Star, they ended up in Chicago in the 1920s where Dorothy wrote articles for The New Majority, a labor newspaper and Carroll worked for the Chicago Daily News under Frank Knox. One of Dorothy’s articles “The Stockwells of Minnesota” appeared in the New Republic on Dec. 22, 1937. Dorothy was especially active in the National Council of Jewish Women, of which she was president (1932-1937). The Binders had four children. Their eldest son Lt. Carroll Binder Jr. died in WWII, lost at sea when his B-17, on which he was navigator, crashed in the English Channel when returning from a Berlin raid. The family was unable to verify his demise for months causing great trauma for the family. After the war it was found that his body had been recovered by a German fisherman and buried in France by the German authorities. There were three other children, daughter Mary Kelsey Binder, born in 1923 and twins David and Debby born in 1931, in London where the Binders were working for the Daily News. They returned to Chicago in late 1931 but after the Daily News changed ownership in 1944 with the death of Frank Knox (who was Secretary of the Navy at the time), the Binders moved to Minneapolis in 1945 to work for the Minneapolis Tribune, Carroll becoming editorial page editor. Dorothy was a founding Director of the Friends of the Wild Flower Garden in 1952 and remained on the Board until 1964 after which she was an ex-officio honorary director until 1976. During her tenure she was Vice-President from 1952 until the death of Clinton Odell in June 1958, when she became President, serving in that role until January 1962. In 1978, when she was 84, the Friends were still receiving donations from her from California. That is the last record we have of her. Her papers are included with her husbands at the Newberry Library in Chicago. 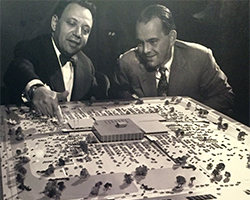 Donald Dayton (right) with Southdale architect Victor Gruen, 1952. Donald Chadwick Dayton was born on Aug. 13, 1914, one of six sons of George N. Dayton and Grace Bliss Dayton. He suffered from polio as a child, and later helped found the Sister Kenny Institute, which did pioneering work in the rehabilitation of polio victims and those with other disabling conditions. Mr. Dayton, was a 1937 graduate of Yale University, joined Dayton's Department Stores as a stockboy shortly after graduation. He held positions as buyer, merchandising manager and general manager, and in 1950 was named president. In 1960 he was elected chief executive officer and when he retired in 1968 he was chairman of the board. He was a member of the National Alliance of Businessmen, the Urban Coalition and the Metropolitan Council. Donald Dayton was a founding Director of the Friends of the Wild Flower Garden in 1952 and remained on the Board until 1959. He also held the office of Vice-President, along with Dorothy Binder, from 1953 to 1959. At the time of the founding of the Friends he was working with architect Victor Gruen on the design of the nation’s first enclosed shopping mall - Southdale Center in Edina MN. Donald Dayton died of Cancer on June 22, 1989. Leonard F. Ramberg, 1972 photo. Leonard F. Ramberg was born on January 10, 1906. His career was centered on business and civic affairs. He was elected a Minneapolis Public Schools director in 1948, a City Council Alderman from 1945 to 1949; he was Minneapolis Postmaster 1954 - 57; a founder and President of the Citizens League of Minneapolis and Hennepin County; and at various times Chairman of the Minneapolis YMCA General Board; President of the American Swedish Institute; Chairman of the Augsburg College Board of Regents from 1966 - 1972. In 1988 he received the Minneapolis Rotary “Service above Self” award, even though he was not a member. In business he was at times Corporate Secretary of the Glenwood-Inglewood Water Company, Treasurer of the Burma-Vita Company and then made a career at Northwestern National Bank from which he retired as Senior Vice President in 1971. He was a founding Director of the Friends of the Wild Flower Garden in 1952 and remained on the Board until 1972 after which he was an honorary director until 1976. Mr. Ramberg also served as the Friends Treasurer during the first two years of our organization and as Vice-President in 1960 and 1961. He and other long-time directors were invited to attend the 1977 25th Annual Meeting of the Friends (June 4) and say a few words. Mr. Ramberg stated he became interested in the garden through Mr. Clinton Odell. He stated that the garden was a tribute to the interest and work of Mr. Odell who really believed in the need for it. Mr. Ramberg then expressed his appreciation for the invitation to be with us on this occasion. That was his last known meeting with the Friends. He passed away on Oct. 22, 1988. Reference: Minutes of The Board of Directors and other documents in the files of the Friends of the Wild Flower Garden, Inc. Text by Gary Bebeau.